We are glad to welcome you to the official website of the Transfiguration of our Lord Russian Orthodox Church, located in the city of Baltimore, the state of Maryland, USA. The church belongs to the original Russian Orthodox Church Outside of Russia (ROCOR) and has as its goal the preservation of the spiritual traditions and the treasure of church services of ancient Russian Orthodoxy. We invite you to acquaint yourself with our church and our parish, to see our small but wondrous iconostasis, to hear our modest choir. When visiting our online Orthodox library, you will be able to acquire deeper knowledge of the Orthodox faith through the spiritually-enlightening materials that are contained therein. These materials are printed in our church bulletins, which are issued monthly in both Russian and English. You are also very welcome to visit our church in person. View our current schedule of services. Reverend Ioann Barbus and the church council. At the half-mark of the Great Lent, the holy Church triumphantly brings out the precious Lord’s Cross to the middle of the church, in order for its faithful members to venerate it with piety and awe. Day by day, week by week passes the time of the Great Lent, which the true Christian tries to use as a time for purifying, renewing, and sanctifying his soul. But if you are spending the days of Lent in your customary idleness and disregard for the salvation of your immortal soul, if your sins hang upon you like a heavy burden, – do not step away from the foot of Christ’s Cross, but stop and fasten your gaze upon the One Who has so widely opened His salvific embrace to every penitent sinner. Regard how Christ loves you: it is for your salvation that He is suffering on this Cross; it is for your sake that He has assumed these terrible wounds and sores; it is for your sake that streams of His innocent and most-pure Blood are pouring forth. Thus do not increase and augment the sufferings of your Lord and Saviour by your customary deceits, sins, and iniquities; prostrate yourself before the Crucified One with humility and penitence, venerate with awe and wonder His wounds, suffered for your sake, and may the merciful Lord help you throw off your heavy burden of sin and instead take on His light burden and His easy yoke. And even for the smallest endeavor undertaken by you for the salvation of your own soul, the Lord will open to you the doors of His mercy, and by the grace of God you will experience in this life the joy of the Resurrection, and in the coming eternal age you will enter into the never-ending joy of your Lord. Amen. Friday of the sixth week of Great Lent marks the end of the 40 days of preparatory lent, during which the Church taught us about repentance, inner prayer, the bearing of one’s cross, ascending the ladder of virtues; taught us to supplicate the Mother of God, in order to obtain the most powerful aid in the matter of penitence; and finally, as the supreme example of its teaching, the Church offered us the image of Saint Mary of Egypt, a great sinner, who, by means of penitence, fasting, and obedience to the Holy Virgin, attained the angelic state in which man was originally created. In one of the holiday hymns the Lord is called “the conqueror of death.” There have been many conquerors in the history of mankind: talented physicians conquered illness, military leaders conquered huge armies; there are conquerors of space and conquerors of distance. But the world does not know any other “conqueror of death” except Jesus Christ. None of the most prominent men in the world have ever aspired to that title. He alone could do so – our Lord and Saviour. During His life on earth He showed His power in three cases: the resurrection of the daughter of Jairus, the resurrection of the son of the widow from Nain, and the resurrection of Lazarus. The death of the daughter of Jairus was a very recent death. She died while Christ and her father were on their way to her. Even Christ called her death “sleep,” but everyone laughed at Him, knowing that she had died. But He sent everyone out and, taking her by the hand, said: “Maiden, arise!” And her spirit returned, and she arose. In the case of the son of the widow from Nain death had taken a stronger hold: the deceased had already been placed on a bier and not only carried out of the house, but was already being carried out of the city gates for burial. The Lord stopped the procession, touched the bier, and said: “Young man, I say unto thee – arise!” The dead youth sat up and began talking. And Jesus gave him back to his mother. Then many of the Jews who were there, and had seen the incredible miracle, came to believe in Jesus Christ. But others went to the Pharisees and told them of what Jesus had done. Christ’s enemies became worried, and fearing that the entire populace might come to believe in Christ, they convened a council and decided to kill Him. But news of the great miracle spread all over Jerusalem. Many Jews came to the house of Lazarus to see him, and having seen him, believed in Jesus Christ. Then the Jewish elders decided to kill Lazarus, too. 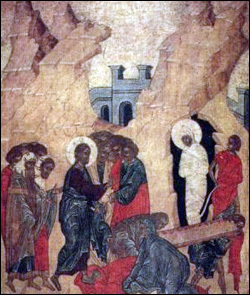 But Lazarus lived for a long time after his resurrection, and later served as bishop on the island of Cyprus. Today, dear brethren, we commemorate that triumphant day nearly 2,000 ago, when the populace of Jerusalem welcomed our Lord Jesus Christ into the city and greeted Him joyously, celebrating the arrival of their Saviour, the Messiah. Everyone was full of joy and celebration; only the Lord alone was sad and sorrowful. But those were the people of former times – you will say, dear brethren. Those were the inhabitants of Jerusalem. We had no part in those events. However, knowledge of all that took place in Jerusalem in those days has reached us, too. But how did it reach us – only as a rumor, as a narrative, or did it pierce our very soul? Did our heart truly feel that terrible betrayal, that terrible outrage against the Son of God? Each one of you will say, of course: “But I have not betrayed the Lord!” However, let us ponder the following, dear brethren: if we do not follow God’s commandments on loving God and our neighbors – is that not a betrayal of the Lord? If we do not forgive others, do not offer charity, do not keep the fasts, – is that not a betrayal of the Lord? If we do not come to church for all the services – is that not a betrayal of the Lord? If, while standing in church, we do not immerse ourselves in prayer, but let our thoughts wander over all manner of earthly cares and concerns, and if we do not pray at home, even though prayer is our direct contact with God, – is that not a betrayal of the Lord? 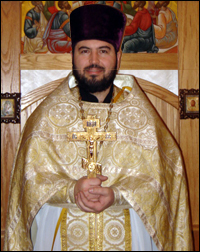 No, dear brethren, let us all gather together in the church, just as we did today, and together with the Most Holy Theotokos, the holy women who remained faithful to Christ, and His loyal disciples, – let us agonize and shed tears over the unholy betrayal to which our Lord Jesus Christ was subjected for the sake of our salvation. Then we, too, will participate together with them in the joy of the forthcoming Resurrection of Christ. Amen. There came the dying moments of the One Who had suffered torment on the cross and prior to the cross, Who had already been exhausted by inner suffering to the point of sweating drops of blood in the garden of Gethsemane, Who was many times struck on the face and hit over the head with a cane in the Sanhedrin and the Praetorium, and Who, finally, during His agony on the cross, suffered pain from wounds, heaviness in the head, and languor of the heart; all of this, following so quickly one upon another, could soon curtail and did curtail the life of the Divine Sufferer. It is well known that of all types of mortal suffering there is nothing more agonizing than death on a cross. With all the strength of spirit and obedience to the will of the Father, which the Son of God showed through all His suffering, even He was unable to silently bear the final torments on the cross. In these terrible moments He found Himself deprived of all help, even that of God, deprived of all His mercy; and this was the greatest agony for His most-holy soul. Even in hell there is no greater torment that God’s abandonment of the sufferers; and to all of this the beloved Son of God had to be subjected! And thus, in the midst of the abyss of spiritual and physical suffering, in the midst of the final agony and spiritual loneliness, He finally cried out in a loud voice: “Eli! Eli! lama sabachthani” – which means: My God, My God, why hast Thou forsaken Me?... Who can fully comprehend the sorrow, the inner torment of the God-man? For the Most-holy to suffer from the wicked, the Creator at the hands of the creation, to suffer for the ingrates, for the very ones responsible for the suffering, to suffer for the glory of God and to be abandoned by God: what an immeasurable abyss of suffering! But not a single fainthearted word issues from the lips of the Son of God, no lament, no protest that God has allowed His Son to suffer so cruelly for the sins of mankind. On the contrary, repeating lovingly the words: My God! My God!, He rues only His terrible condition, but expresses no complaint against God. And what do we see? Even such a prayerful cry on the part of our suffering Saviour, worthy only of pity, spurred the insane people around Him to new mockery! They misinterpreted His words through similarity of sounds and said: “See how He is calling Elias.” The Jews believed that the prophet Elias would appear on earth right before the arrival of Christ; therefore, by means of such mockery over Christ they were telling the people: look, He is dying, yet He is still trying to pass Himself off as Christ: see how He is calling Elias to Him! Now everything that had been said in the psalms and the writings of the prophets came to pass in regard to Jesus Christ with absolute accuracy, so that the words uttered several centuries before seemed to have been written right at His cross. For example, King David said in his psalms: “My God, my God, why hast Thou forsaken me? They that hate me without a cause have increased… My heart has been subjected to reproach and suffering: and I looked to some to take pity, but there was none, and for comforters, but I found none. For like wicked dogs they have compassed me; they pierced my hands and my feet, they stretched out my entire body, and they stare at me with disdain. They part my garments among them, and cast lots upon my vesture. I am like a worm before them, and no man: a reproach of men, and despised of people. All they that see me laugh me to scorn; they shake their heads, saying: he trusted on the Lord; let Him deliver him, if he is pleasing to Him. The sorrows of hell compassed me about; the snares of death have taken up dwelling within me. My strength has become poured out like water, and all my bones are out of joint; my heart is like wax, it is melted in the midst of my bowels. My tongue cleaveth to my jaws, and I am nearing death. They give me also gall to taste, and in my thirst they give me vinegar to drink” (from Psalms 22; 69; 18). All of these words now came to pass in regard to Jesus Christ. And when He tasted of the vinegar, He said: “It is finished.” And then, gazing up into heaven, He cried out in a loud voice: “Father, into Thy hands I commend My spirit.” And having said this, He bowed His head and gave up the spirit. Thus ended the life on earth of the One Who only came here to suffer and die for mankind. But God’s mysteries were not concealed from those who reasoned spiritually. God not only announced through the lips of all His holy prophets, but revealed in other ways and showed in many examples the forthcoming life and death of the promised Redeemer of the world. Thus the innocent Abel, the first righteous man on earth, is killed by his brother as a sign of how the supreme Righteous One, being totally innocent, would be killed by His kindred. Abraham, who out of love for God sacrificed his only son, serves as an image of how God Himself so loved the world, as it is said, that He even gave His only-begotten Son, that whosoever believeth in Him should not perish (John 3:16). Joseph, beloved son of Jacob, sold by his brothers into alien captivity for 30 pieces of silver, clearly symbolized Christ, Who was betrayed by His disciple and His Jewish compatriots. The serpent which Moses hung up on a cross to save from death those who had been bitten by snakes in the desert symbolized the crucified Saviour of the world. Pointing this out, the Lord said even before His suffering: just as Moses lifted up a serpent in the desert, so must the Son of man be lifted up. The killing of animals as a sacrifice to God for the sins of men represented the death of Christ for the salvation of the world. The burnt offerings themselves, performed by law outside the camp, indicated the death of Christ, which took place outside the city. Such were the many prophetic images of the suffering and death of the God-man. God revealed this to men from ancient times, and also sent many prophets who foretold of the Saviour and of all that was due to happen to Him. And everything that God revealed from the beginning of time and spoke through the lips of all His holy prophets came to pass in regard to Jesus Christ with absolute accuracy. Moreover, the death of Christ was attested to by fearful events in nature, which occurred at the moment when the Son of God gave up His spirit to God. The signs of God’s presence upon Mount Sinai seemed awesome to the Jewish people, when the mountain spewed smoke and became covered with dark clouds, when thunder rolled and shook the very foundation of the mountain. “Yet once, and I will shake the heavens, and the earth, and the sea, and the dry land” (Haggai 2:6), – said the Lord through His prophet, – and now, with the death of Jesus Christ, the earth suddenly trembled, and the stony cliffs cracked in many places. Golgotha still stands with such a crack to this day. It was fearful to see how all of nature trembled, as though having reached its end; from the earthquake or some other divine force even the veil in the altar, which was affixed to the entrance into the holy of holies, was rent in twain. Seeing this awesome manifestation, all the people became frightened, and beating themselves in the chest, fearfully returned home. The centurion, head of the Roman guard, who stood near the crucified Christ, seeing such terrifying events in nature, became frightened and said: “Certainly this was a righteous man; truly this man was the Son of God.” And not only the centurion, but also the other soldiers who were watching over Christ with him, frightened by the great earthquake, repeated: “Truly this was the Son of God.” The Lord rightly said: “When ye have lifted up the Son of man, then shall ye know that I am he” (John 8:28). “Know therefore and understand, – said the prophet Daniel, – that from the going forth of the commandment to restore and to build Jerusalem, after threescore and two sevens (i.e. 62 seven-year spans) shall the Messiah be cut off” (Dan. 9:25-26). And so this prophecy came to pass in the time indicated; the residents of Jerusalem and their leaders, having condemned Him, fulfilled the words of the prophecy that were read every Saturday. And not finding any guilt in Him worthy of death, they talked Pilate into killing Him. Had they been wiser, perhaps at that moment they could have understood that it was not a common man whom they had killed, for there could not have been such terrible manifestations if He were like other people. But they were so blinded by envy that they did not even wish to know how badly they had acted in killing Jesus Christ, although in the parable of the evil vineyard tenders He taught them not to do so. There He clearly presented the evil deeds of their fathers, who had beaten up all the prophets sent to them from God, and said that they, too, would commit the deeds of their fathers. For when God sent His Son to them, seeing Him they said: let us kill Him, and the inheritance will be ours. 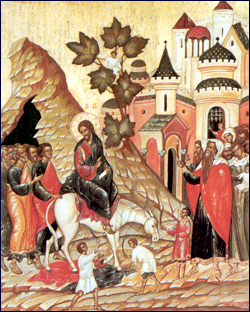 And seizing Him, it says in the parable, they led Him out of the vineyard and killed Him. Thus Jesus Christ foretold them even the very place where they would kill Him. And finally He pointed out the prophecy itself, saying: Have you never read in the Scriptures: the stone which the builders refused has become the cornerstone. This is the Lord’s doing; it is marvelous in our eyes (Psalm 118:22-23). The day on which Christ suffered and died was the last day before the Jewish Passover, and Christ’s killers, not wishing to leave the crucified men on the cross in order to avoid unseemliness for the holiday, asked Pilate to quicken their deaths by breaking their knees and to take them down from the cross. And thus for the sake of the Sabbath, a day of solemn rest, the crucified men were forced to suffer new agonies. The soldiers sent by Pilate came and broke the bones of the legs of both the one and the other thief. Coming up to Christ and seeing that He had already died, they did not break His legs, but instead, for further confirmation of death, one of them pierced His chest between the ribs; and immediately there poured forth blood and water, the mortal liquid which only issues from the deceased. And even this event clearly prophesied of Christ: “And they shall look upon the One they have pierced” (Zech. 12:10). Now Christ hung on the cross lifeless and inanimate, but His intimates did not leave Him; they gazed from afar at all that was happening to Him. These were all women – Mary Magdalene, and another Mary, mother of James and Josiah, and Salome, mother of the Zebedees, and many others, who had followed Him and served Him when He preached in Galilee, and who finally came to Jerusalem together with Him. There is no doubt that they were now weeping bitterly over their dead Master, Whom they respected and loved, but bitterest of all was His Mother’s lament. 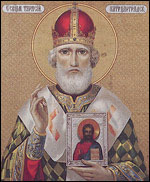 On March 10th (February 25th by the old calendar) the Church commemorates Saint Tarasius, Patriarch of Constantinople. Saint Tarasius was born in Constantinople, in the family of the affluent and notable courtiers George and Eucratia, who brought up their son in the fear of God and provided him with a good education. While still young he was elevated to the prominent civil position of senator. In 783, when Patriarch Paul of Constantinople died, and the question of his successor arose, in the entire city of Constantinople there was no worthier candidate to be found than the senator Tarasius, who was directly elected to the position of patriarch. However, due to his fervor for Orthodoxy, Saint Tarasius agreed to the election only on condition that an ecumenical council be convened, in order to suppress the raging tempest of the heresy of iconoclasm, which was creating a rift in the Orthodox Church at that time. The heresy of iconoclasm originated in the early 8th century, when the Greek emperor Leo III decreed that all holy icons be taken out of churches and homes, and burned in the city squares. 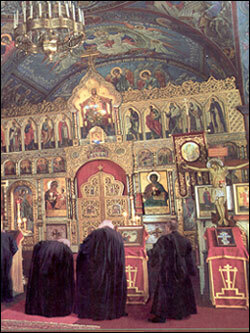 The decree was motivated by a false belief that the worship of icons was a form of idolatry. When the people began to resist this decree, to the persecution of icons Emperor Leo added the persecution of their worshippers, and many of the faithful were tortured and killed at that time. Nevertheless, the people continued to revolt against the Emperor’s decree, and prominent theologians of those times wrote from all sides, denouncing Emperor Leo: as, for example, St. John Damascene from Syria and Pope Gregory II from Rome. After the death of Emperor Leo, his son and successor, Constantine Copronimus, continued the iconoclastic efforts of his father, but decided to try a different approach. He convened a false council, at which the clergy which he had set up condemned the worship of icons. As a result of this false council, not only were icons continued to be destroyed, but also priceless frescoes on the walls of famous cathedrals were plastered over. From persecution of icons Constantine turned to a persecution of holy relics, and then to a persecution of monasteries, which were all either destroyed or turned into barracks, while all the monks were brutally martyred. The heresy of iconoclasm continued almost throughout the entire 8th century, and only towards the end of it, during the reign of the pious Empress Irene and as a result of the election of Saint Tarasius, the worship of icons was restored. Through the efforts of the Empress and with the full support of Saint Tarasius, the 7th ecumenical council, attended by more than 300 bishops, was convened in 787. The council totally condemned the heresy of iconoclasm, condemned the false council that had been convened by Copronimus, and triumphantly restored the worship of icons by determining that in honoring the icons we honor and worship those who are depicted on them. The holy Patriarch Tarasius ruled the Church for 22 years and peacefully departed this world in 806.